Darren Hayman ’s love letter to English rural life continues with a second volume of his Thankful Villages series. As a reminder, a thankful village is one where all residents those who went off to fight in the First World War incredibly came back alive. There are around 50 UK wide and former Hefner man Darren Hayman has set himself the task of visiting and dedicating a track to them all. Some are spoken word, with the villagers themselves telling tales of war and village life. Some are instrumentals, some with a full band feel. There’s electronica, folk, pop and sometimes just the sound of creaking trees, gates bashing in the wind and birds singing. While the first volume stuck more rigidly to the original theme of war through a focus on village churches, this second outing takes on themes of rivers, ageing and death, meaning events other than the Great War take precedence. This includes the tragedy of a 1974 factory explosion, that killed all the workers inside but miraculously no one in the local village of Flixborough. The first hand account of survivors Derek and his son is extremely powerful. There’s also an interview with a grave recorder in Maplebeck, who has a lovely exchange with Darren Hayman where they both struggle to decipher one particularly eroded gravestone to ensure whoever lies beneath is not forgotten. There’s a bloke doing something eccentric with vegetables on Colwinston and the shifting importance of the river to those living in Cromwell seems like a vital oral history tale demanding to be preserved. Combined the tracks have a radio documentary feel to it rather than an album, but there’s still some decent pop here too, most notably the Ray Davies inspired ode to village life, Woodend. In addition Fairport Convention’s Judy Dyble drops by to sing on Upper Slaughter. As a village dweller and in particular one in Somerset, which appears to be the most thankful county judging by its presence across the two volumes, this latest volume offers, in the main a faithful depiction of our life. The keen sense of environment, of community, of religion and the changing economy over time, is all there, nestled among the churchyards and fields. However, it can feel a little too picture postcard-like in places and comes across exclusively as a history project rather than its intended focus of using rural settings to inspire Hayman in music and other art forms. This is particularly the case on this volume, which with a focus on ageing is understandably dominated by the voices of the elderly and discussion of the past. Prior to an update and intervention from Darren Hayman, this review had lamented the lack of young voices so far in this Arts Council funded series. Turns out this is all in hand with volume three set for release in 2018 and with a focus on village schools and the young. 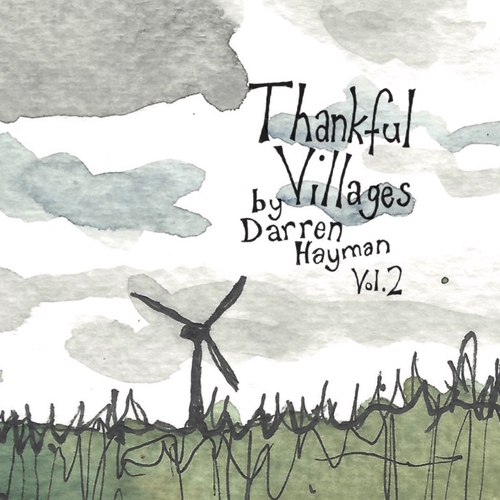 For more information about Darren Hayman – Thankful Villages Volume 2 click here. UPDATE: This review has been updated to ensure we clarify that this volume is themed around death, ageing and rivers and that the young get their turn on volume three. Happy to clarify that. Volume One is themed around churches. Volume Two is themed around the river and death, says so in the notes. Volume Three will deal with village schools and the youth.